I’m back with another recommendation for you all. If you are interested in a TV series featuring crime, murder, and well-written queer representation, you should consider watching Dogs of Berlin on Netflix. The first season is only 10 episodes long, and I hope the show gets a second season. Dogs of Berlin features a narrative which addresses certain socio-economic, political, religious, and racial issues being faced in the area while offering an interesting murder mystery for viewers to sink their teeth into. You have the mafia, passionate football fans, neo-Nazis, discrimination against the Turks, and a whole lot more. The world of crime in Berlin isn’t for the soft-hearted, and the show makes sure to remind you of that every chance it gets. The protagonists of Dogs of Berlin are cops Kurt Grimmer (Felix Kramer) and Erol Birkan (Fahir Yardim). Kurt is a former neo-Nazi sympathizer who was able to change his ways through the love of his wife, Paula. However, Kurt still has character flaws, which include betting, having an affair with his ex-girlfriend, and being open to making illegal decisions as long as the ends justify the means. Erol is of Turkish descent and is in a loving relationship with his boyfriend, Guido (Sebastian Achilles). Erol is someone with very strong principles. His life’s mission is to take down the clan named Tarik-Amir, whose leader has ties to Erol’s past. Erol, being from a Muslim family, also has to deal with his father not approving of his sexuality as well as the usual homophobia he experiences around him. And yes, there is a lot of homophobia in this show, so be ready. The murder of Orkan Erdem, a Turkish player on the German team, leads Kurt and Erol to work together on a case which seems to involve Tarik-Amir, the entire betting mafia, and more. 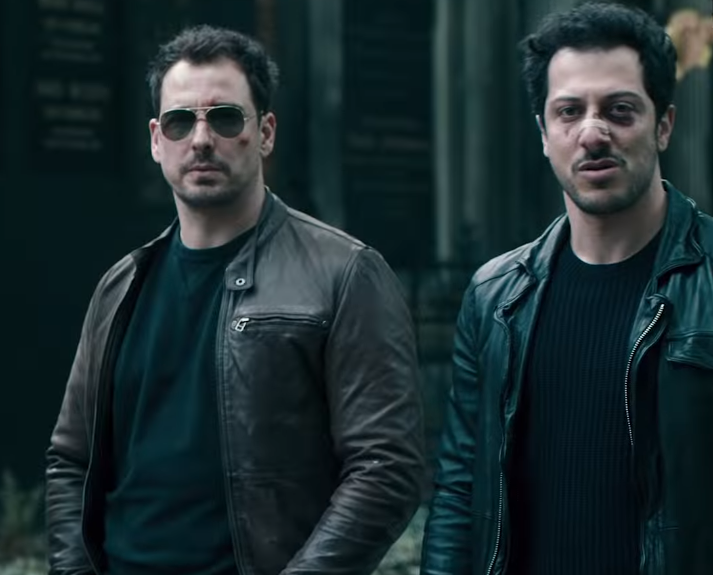 Dogs of Berlin makes sure to let us know about everyone involved in the game. The Tark-Amir clan includes Hakim (the boss) and his younger brother Karim. The clan profits from drugs and has control over certain territories in Berlin. Karim, always being in the shadow of Hakim, has ambitions to control the betting business and gain more power in the clan. Due to Karim’s goals, the clan has to take down Tomo Kovac, who controls the betting circles in Berlin. Karim also blackmails a young footballer, which offers a behind-the-scenes look at how the Football Association protects the popular sport. Also connected to Kovac is Kurt because the corrupt cop owes him money. The neo-Nazis get involved when Kurt decides to steal money from his brother Ulf (Sebastian Zimmler). Zimmler’s mustache game is on point! I know Ulf is a neo-Nazi, but still! Erol ends up asking Murad, a young boy aspiring to become a rapper, to spy on Tarik-Amir and because of Murad we get to know about his very likable older sister, Maissa, and Raif (Hakim’s driver and cousin). Everyone is connected and it is so much fun seeing the characters make individual moves for their own gain. With the entire story taking place over 7 days (if I’m not wrong), the series maintains a good pace of events. Dogs of Berlin doesn’t shy away from criminal life and how evil such people are. So, be ready for blood and gore. My only gripe with this show is it left me wanting more from the female characters. Paula, Sabine (Kurt’s ex-girlfriend), and Maissa aren’t directly involved in the criminal world. Their scenes do offer some breathing room, but I hope they play more integral roles in the second season. I also hope the lesbian Police chief (who is married and has a kid) gets more to do as well. I did appreciate the show giving Trinity and Petrovic more agency. Trinity is definitely a woman you shouldn’t mess with. And I loved seeing Petrovic standing up for herself against Kurt. To me, it felt as if Dogs of Berlin was building the groundwork for certain female characters to play a larger role as the series progresses. So, fingers crossed that if a second season is greenlit, the narrative builds on certain plotlines. Anyway, do you know which character I don’t want to see more of and want to stay away from the criminal world? Guido! Let him stay safe from all the danger. It is very rare to see shows not following the ‘Bury Your Gays‘ trope and I don’t want to see it happen in Dogs of Berlin. Yes, Erol can continue fighting crime, but his boyfriend needs to stay far away from all of that drama. Their supportive relationship is very sweet. So don’t ruin it, writers! I highly recommend you consider watching Dogs of Berlin if you are a fan of flawed characters and well-written queer representation. The story also makes sure to talk about the issues being faced in Berlin, which allows this show to come across as much more than your typical murder mystery. Due to it feeling too ‘real’ it might not be for everyone. But still, give it a try. Next: Dylan O’Brien Accused of Stealing Queer Role In ‘Weird City’! I’m So Tired! Thank you for the review Farid. Personally (and I only speak for myself) I want to see shows specifically geared to gay men. After a lot of thinking I realized that I don’t want to see ‘queer representation’. For me queer representation means you take a show aimed at a general audience and put in queer characters and stories which are blended with other straight characters and stories. I am not interested in seeing that. Erol looks like a cool character and I would be happy if somebody watched the show and enjoyed it. From past experience I have learned the hard lesson that you have to only support what you like that way you will more of that. Unfortunately this is a pass for me.